We are in Mexico!!! Already enjoying the cold beers and the tasty fajitas! We slept on the Pacific coast with an overwhelming smell of salt sea and the continuous sound of the big waves lulling us to sleep. Now heading south on the Baja Peninsular, then we will take the ferry from La Paz to the mainland. 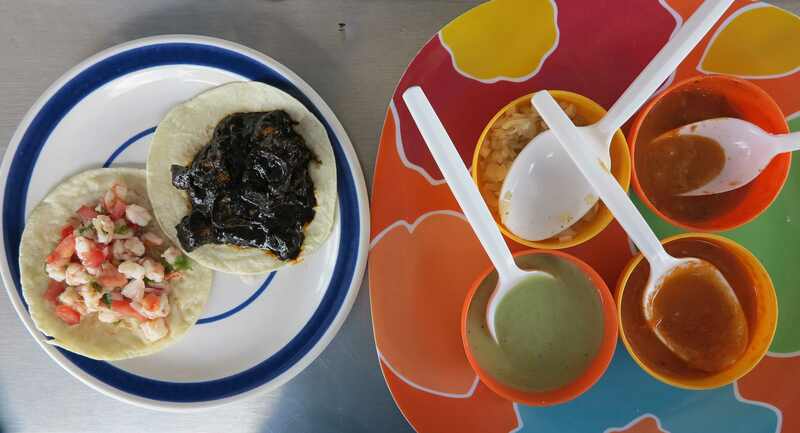 Mangos, Tacos and Coco Locos – Enjoying Mexico! Our Mexico so far…long sandy beaches with huge waves crashing in from the Pacific Ocean, “chut chut” crazy traffic but now we are getting used, driving on narrow winding roads through km after km of coconut and mango plantations or through a forest so dense that it occasionally closes over the top of the road so it is like driving through a green tunnel, fruitstands along the road selling mangos, papaya, pineapple, coconuts etc for almost nothing, vaqueros (mexican cowboys) on horseback, very hot days with roadworks and dust from big trucks, cool nights with a breeze from the sea, sleeping in the tent to the sound of the crashing waves and the rattling of the leaves on the palm trees, strawberry margaritas and cold beers, incredibly tasty food served from small roadside cafes or street restaurants and extremely kind people. We have been through a lot of police check points and military check points and in certain regions we have seen a lot of military on the road. But we have had no problems with either military or drug gangs or any kind of criminals. We ask people we meet how the situation is in their region. And in one case a soldier at a military check point told us not to stop for the night in the small villages along a specific stretch of road since they were running an offensive against the drug gangs there. So there is a security issue but it has not affected any of the travellers we have met. The police in Acapulco tried their best by pulling us over for not using the indicator when we were changing lanes – and asking us to pay a fine of some 150 EUR! And by the way, we could have back the driving license and the papers for the car “manana”. Thanks to Marco speaking perfect spanish and to our training with corrupt road police in Kazakhstan we ended up paying nothing and getting our documents back! So unfortunately, corrupt police is still a problem for travellers in Mexico. 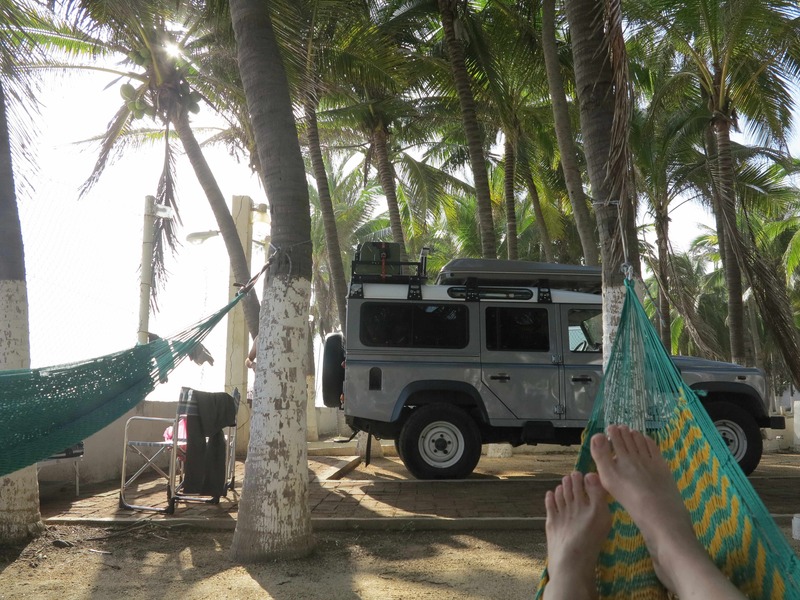 By now we are well down the western Pacific Coast, tonight camping close to Acapulco in a cool and breezy campground right on the beach and full of the sounds of the waves and the wind in the palm trees. We have hung up our hammocks between the palm trees and are swinging slowly in the breeze while drinking a cold Victoria beer and collecting appetite for dinner. The temperature is incredibly pleasant and the sun is just setting. But not all days were like this! 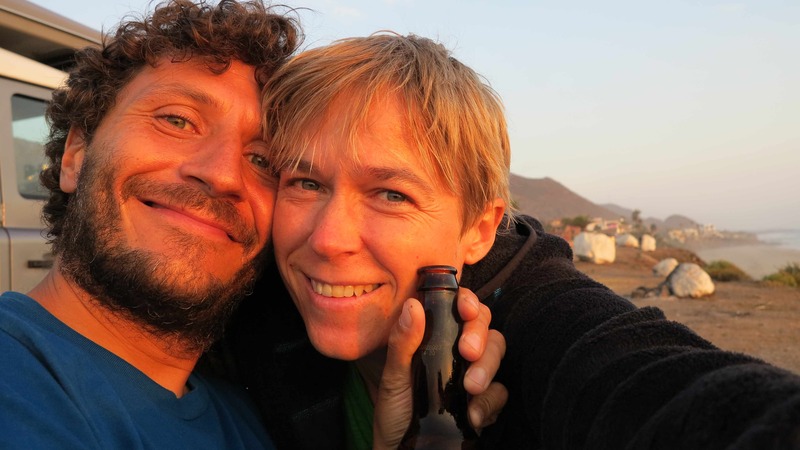 We have been tormented by incredibly hot and humid sleepless nights like a hot summer night in Dubai, millions of tiny biting mosquitos, lightning and thunderstorms and winds so strong that we had to get up in the middle of the night, bring down the tent and sit in the car! But these were generally the few nights that we spent on the coast of the Gulf of California or in the lagoon north of San Blas. 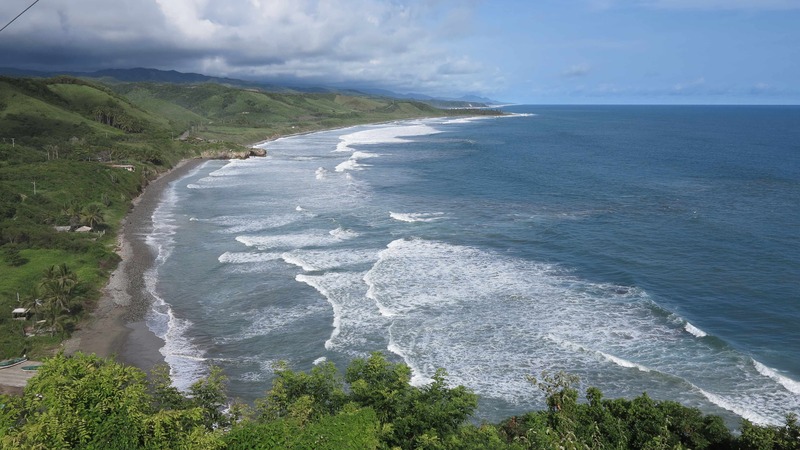 Along the coast of the Pacific Ocean we have thoroughly enjoyed. And if it was not for our plans in South America we could easily spend twice as much time here. As a matter of fact, we could spend one month here just eating shrimp tacos!! After a day of relaxing at the beach of Zipolite, we left the coast of the Pacific Ocean and climbed 2000 m up to the city of San Cristóbal de las Casas in the province of Chiapas, close to the border to Guatemala. 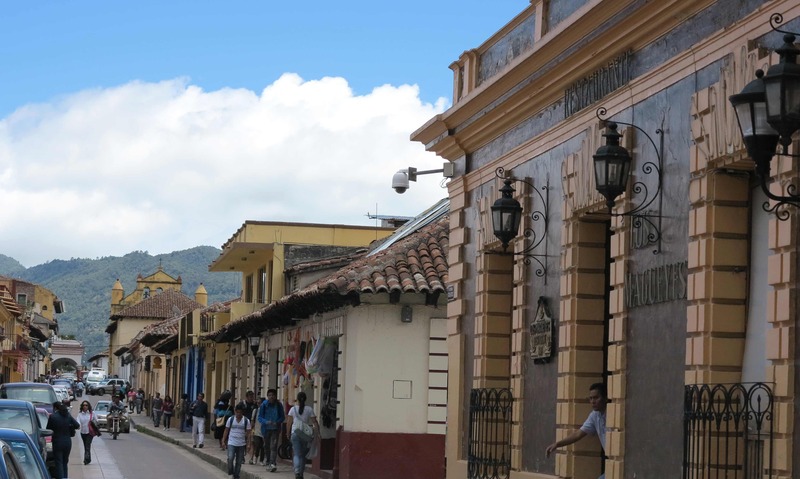 After the hot and humid coastal climate it was wonderful to stroll the streets of cool and breezy San Cristobal. The city was founded by the spanish in 1528 and the spanish colonial architecture is still preserved in the historical city center with its churches and cathedrals, cobblestone streets and low stone houses with red brick roofs. We were in San Cristobal on a Monday so most of the museums were closed but we enjoyed a visit to the market including a very cheap and delicious taco lunch. 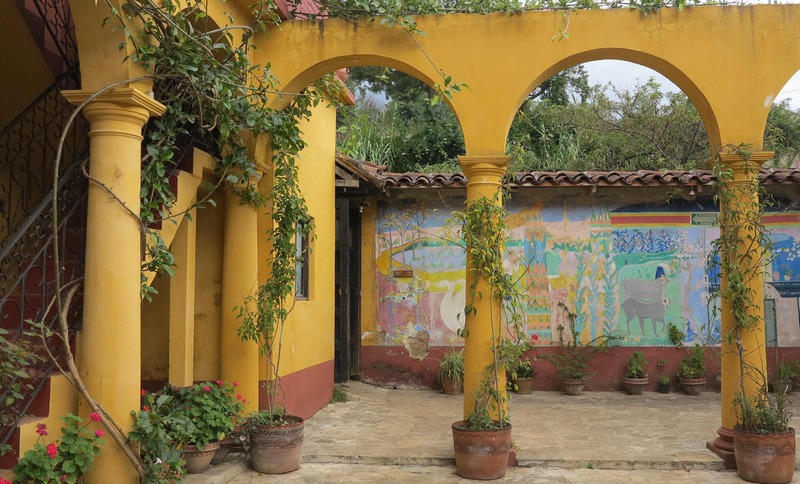 And the highlight was a visit to the Casa Na Bolom, founded by the danish archeologist Frans Blom and his german swiss wife, photographer Gertrude Blom. Frans Blom was one of the early explorers of Palenque, the important Maya ruins about 150 km east of San Christobal and Gertrude Blom photographed the Laconda Maya, the only Maya people who were never conquered or converted by the Spanish. The black & white photographs were on display in Casa Na Bolom together with a collection of the couple’s original Maya artifacts. The photographs were fantastic, just a few of them can be seen here: http://www.flickr.com/photos/trudiblom. The next day we drove the 250 km (5 hours) from San Cristobal to Palenque and installed ourselves in a lovely campground on the edge of the jungle. In the evening we could hear the strange growling shouts of howler monkeys and numerous birds and chikadas. Anually, more than 2 meters of rain falls here and in the night we found out how this is possible….it simply fell down from the sky in massive biblical amounts! 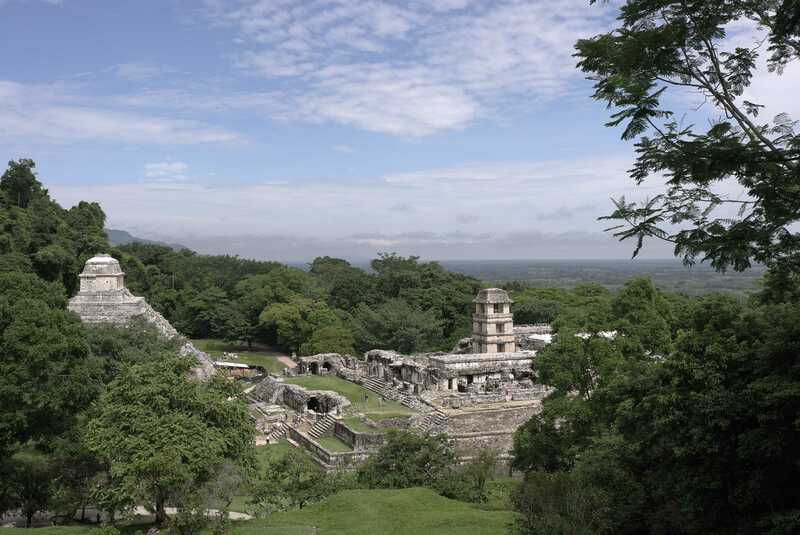 Main sites of Palenque with the temple of inscriptions to the left and the palace where the ruling class was living to the right. Early morning we headed out for the impressive Maya ruins at Palenque. According to Wikipedia, the ruins are dating back to around 226 BC until the site was abandoned at around 1123 AD. Then the large and beautiful mausoleums, temples and palace was absorbed by the thick jungle until they were discovered by a Mexican explorer in 1773. Apparently excavations of the site only started around 1950 and still today it is estimated that only some 2-5% of the ancient has been uncovered. The main sites have been restored and are excellent examples of Maya architecture. But equally interesting were some of the more peripheral ruins which are still embraced by the humid green dimness of the jungle. Attached to the site is a small and hot museum with some interesting exhibitions on the finds from the site. 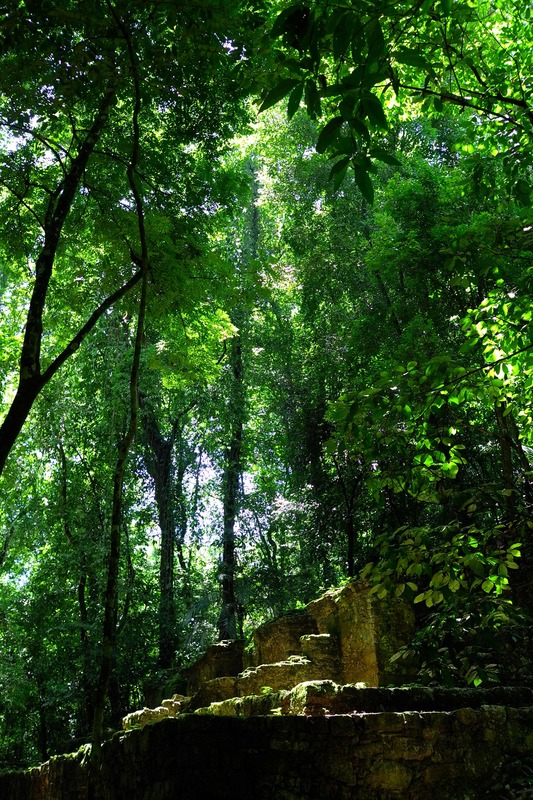 Palenque ruins embraced by the green jungle. From Palenque we drove north towards Yucatan. In Champoton, on the western side of the Yucatan peninsula, the road joined the coast of the Atlantic Ocean and we stopped to have tacos with FRESH seafood – squid, shrimp, fried fish and lemon-marinated fish – delicious!!! 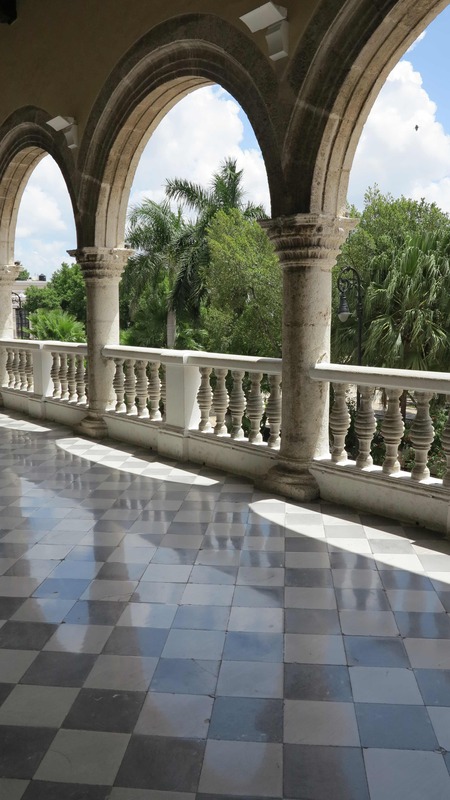 Then we continued north to Merida, the charming capitol of the Yucatan province. Like San Cristobal, Merida is a Spanish colonial city but it is less touristy and so it is more relaxed, without all the souvenir sellers or handicraft producers who are trying to push you to buy this or that. Merida was founded in 1542 on the site of an ancient Maya city and limestone blocks from the Maya ruins were used to construct many of the old buildings in the city center. In the late 1800-1920’s, Merida got very rich on the henequen fiber trade. This very strong fiber comes from the leaves of an agave plant and was used for producing ropes, which were sold around the world. Many mansions of rich families were built during this period. The same fiber is still used in the region for producing all sorts of stuff including our new very rough looking hammocks! 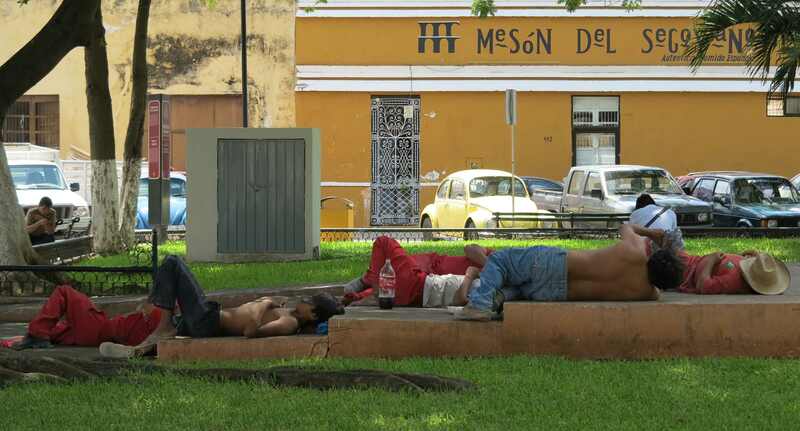 People in Merida are very kind and love to talk and explain about their city. We talked at length with the museum guard at the Montejo mansion about the local tequila customs (how did we start speaking about tequila?) and a small but very energetic woman from the tourist agency (the Maya are very very small people!) stopped us on the street to talk about Merida, about Italy, and about everything else. The city is full of “patina” and old VW “bubbles”. We walked the streets all day, enjoying watching the people on the streets, the old colonial mansions, the layers of peeling and fading paints, the small supermarket with inside stucco, arches and columns, the mix of old and new. We also visited the Museum of Anthropology, which has both a good exhibition on Maya culture and good air conditioning! We ate very well in Merida! 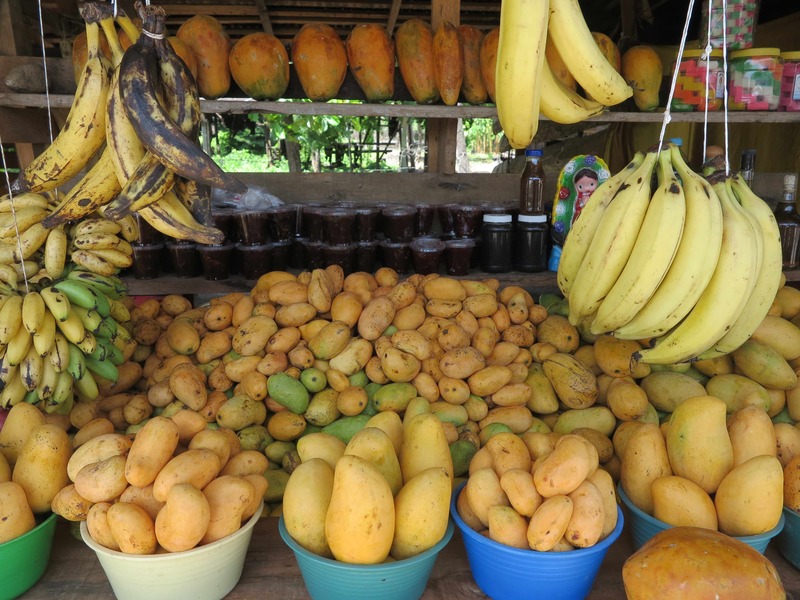 During the day we had ice cream prepared with fresh fruit (mango, coconut, tamarind) and small coconut “empanadas”. In the evening we followed the suggestion of a couple of the locals and went to the “loncheria” Punta y Coma inside the central Mercado. All the small shops were closed but the “loncheria” was bustling with people who were eating the local Yucatan specialties like salbutes, panuchos and tamales. The busy women working in the loncheria were strictly surveyed by Alfredo and Jose, dressed in white shirts and closely following everything that went on, both in the kitchen and at the eating counters. It is brilliant to eat in these small places where you can sit and watch the preparation of your food as well as the coming and going of the customers. And the food was excellent! We slept in the Nomads Hostel, at the corner of Calle 62 and Calle 51. It is a very nice place with WiFi, a hammock courtyard, a small garden and a swimming pool. 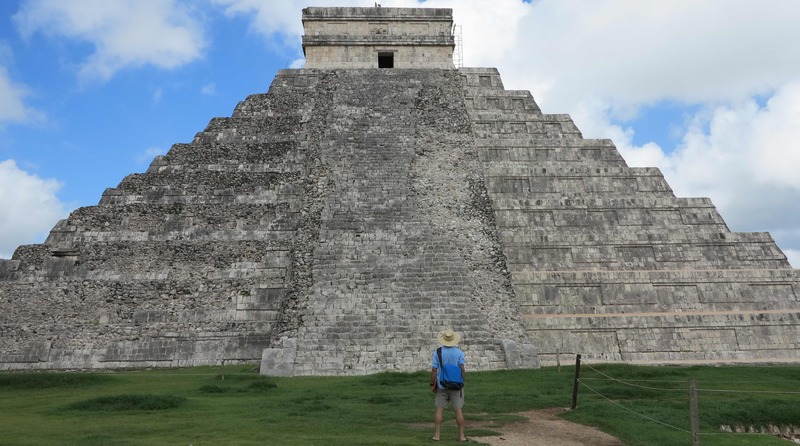 The next day we continued to Chichen Itza, which was one of the largest cities in the ancient Maya world and a major economic power at it’s peak. It flourished from 987 AD when the Toltecs conquered the city and until about 1224 when it was abandoned. It has been quite extensively restored and is well worth a visit. We came at 9 and spent 3 quiet hours at the site until 12 when the tour busses started to arrive with crowds of tourists. Only minus was that the ice creams were 3 times as expensive as outside the park! From Chichen Itza we drove to Tulum on the Atlantic coast, south of Cancun and the famous Carmen Beach. We found a place to camp at Playa Las Palmas and spent the afternoon at the beach. The water was turquoise blue and the sand was white and fine like flour! The beach was just irresistible. We had a brilliant barefoot run in the sand the morning before driving to Chetumal, which is just on the border to Belize. 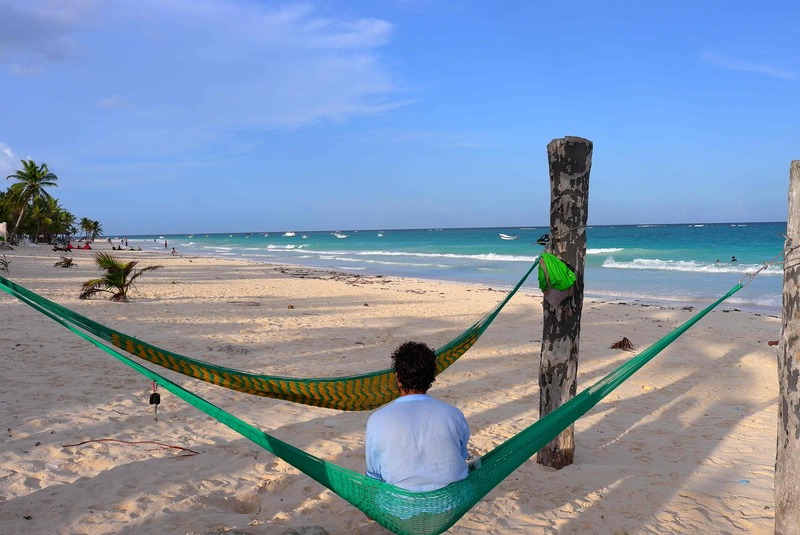 In Chetumal we stayed at the Yax Ha Camping, a very clean, friendly and quiet place to sleep. Tomorrow we are leaving Mexico….and we are a bit sad to go. We especially enjoyed Chiapas and Yucatan, both for the impressive Maya ruins but also for the atmosphere, the welcoming people and for the food they prepared for us! Despite the sadness, we are also very excited to continue our experience south…Guatemala, Costa Rica, Peru, Bolivia and Argentina will be the next countries to explore. We’ll have to substitute tacos, mangos and cocos locos with pisco, ceviche, asado….and a lot of mountains!!! Enjoying the last moments of Mexico with a cold beer in the hammocks. reading your text worth long days of holidays. Please continue!